Let your child discover the world from a Bobike Mini City and get out and about together without a care in the world. This front-mounted child seat gives your child a safe comfortable ride. Its adjustable 3-point safety belt and footrests means a snug safe fit as your child grows from 9 months to 3 years of age. The smart design of the 3-point patented safety belt with its ergonomically shaped shoulder element and unique upper closure keeps the safety belt from slipping off of the child’s shoulders and ensures a safe sitting position. For the tiniest tots, the Bobike Mini City can be equipped with a safety headrest. Movable little handlebars that let the child ‘steer’ make a nice detail, and the elegantly designed windscreen makes the Bobike mini City complete. 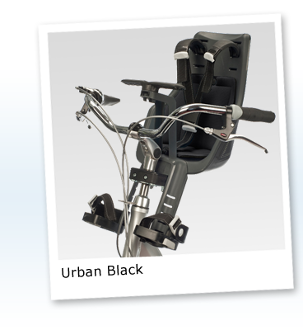 The Bobike Mini City is also quick and easy to attach to your bicycle with its universal mounting bracket that fits both a standard and A-head handlebar stems.